This version is in beta stage. Warning: the "quota" feature is not (re)implemented yet. Bug fixed: when selecting "a specific user", the list of users isn't shown. Fixes a blocking bug on activation with Piwigo 2.5 and mysqli. Bug fixed: avoid warning on pwg.categories.getList. This warning was impacting iPhotoToPiwigo export plugin. 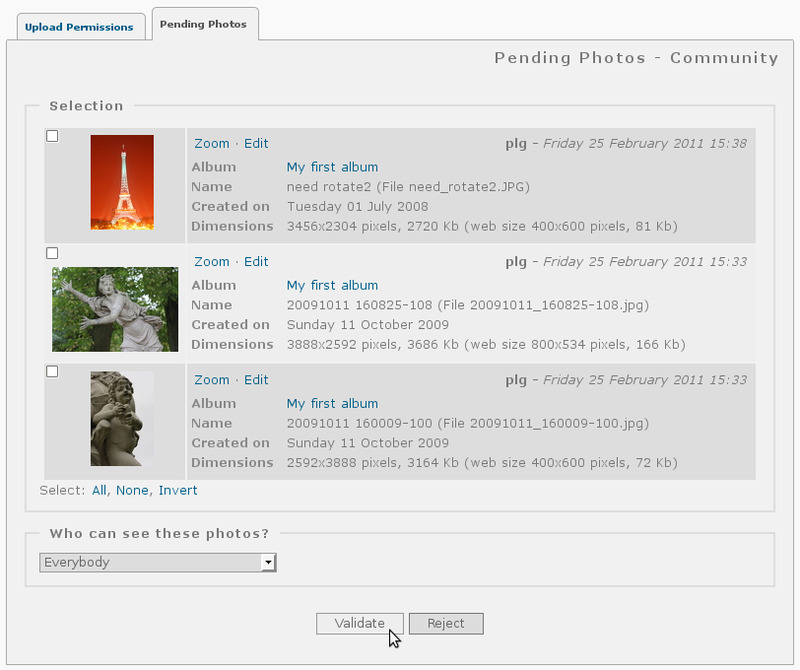 Compatibility with Piwigo 2.3 and its new upload form. No need to have $conf['community_ask_for_properties'], setting photo properties becomes an optionnal fieldset (display on demand) in the upload form. * in the Batch Manager, privacy "level 16" displayed as "Pending"